A young girl named Imogene awakes one morning to find that she has grown antlers. No one can figure out what the cause is? !The next morning, Imogene's antlers have disappeared but her family is in for another surprise! 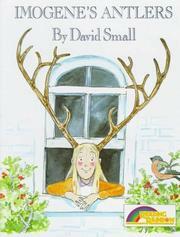 Small, David, “Imogene's antlers,” Children's Picture Book Database at Miami University, accessed April 19, 2019, https://dlp.lib.miamioh.edu/picturebook/items/show/9241.